← Signs of Spring 9: Peepers! A couple of weeks ago I was sitting in my car up in the parking lot of the Environmental Learning Center at Harrison Hills Park just next to the purple martin houses. 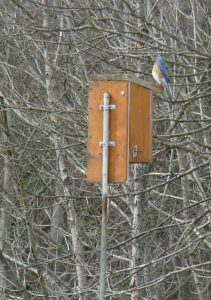 I had just walked my bluebird circuit to check our nesting boxes and was waiting for Deborah to return from an early season wildflower walk. It was a cool, cloudy day, and I had to keep the car windows rolled down to prevent fogging them up with my breath. I spent my car time looking at birds. The purple martin houses were recently uncovered, but the martins had not yet returned from their over-wintering ranges (they are back now, though!). The large, communal houses remind me of my old neighborhood in Houston. It seemed like every other house on my street had one of these purple martin apartment complexes prominently displayed on a tall pole. I can’t remember how many of them actually had birds in them, though. A northern flicker landed in a circle of low grass and started very purposefully pecking the ground. I assumed he was eating ants (a flicker’s favorite food!) and I glanced at my watch to make a note of how long he would stay in that spot anting. He hardly moved a half a meter in the hour and a half! His hunting style was as stationary as could be! Find a place with ants, stay put and eat the ants! Sometimes life is a simple equation! About twenty meters from the flicker five robins were also looking for food. I assumed that they were looking for earthworms that might be lingering on the surface of the wet soil. The robins moved in a beautifully choreographed dance across the grassy field: each bird stayed about five meters away from their closest neighbors. When one bird moved the others reacted, and the small flock methodically worked their way across field. Their movements were sudden and saltatory: five or six quick steps, a head turn to focus one of their eyes on the ground (they usually used their right eye) and very occasionally a peck and grab, and even more occasionally a head shake and a swallow. Once or twice a new robin landed among the hunting cohort. This threw all of the established birds into a cackling furor. 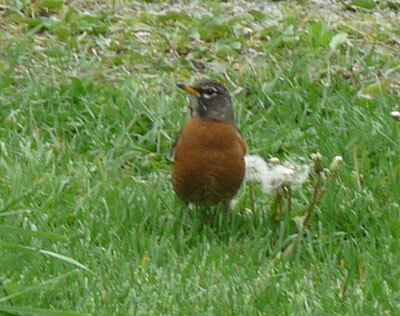 The robins flapped their wings and lifted up a foot or so about the ground, and then re-settled into their familiar spacing with their additional flock member and continued to work the field. Bluebirds (early arriving males) were also out in the field. They flew from clump of tall grass to clump of tall grass grabbing onto the upper portion of the grass stems to survey the section of the field in front of them. They seemed to avoid the part of the field being worked by the robins and flew many tens of meters at a time from grass clump to grass clump. I could see the bluebirds turning their heads through an acute angle as they scanned the ground area immediately in front of them. Even rarer than one of the robins pecking up a worm, though, was one of the bluebirds crashing down to the grass surface in front of them to snag an insect (or worm?). Any success by one bluebird was immediately noticed by the others, and they flew in close to see if there were more morsels in that spot to consume. Off on shrubby edges of the field I could hear a familiar “cheeritt” call. Towhees were calling and hunting in the leaf litter. 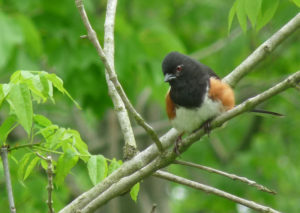 The towhees have only very recently returned to the park after overwintering in nearby valleys and sheltered areas. They are short-distance migrators that seek out sources of food (berries etc.) to sustain them through the winter. They then return early in the spring to their summer breeding ranges. Towhees have a different way of hunting for their food. They attack a layer of leaf litter with their feet and send leaves and soil flying in a cloud of disturbance. They then jump back and explore the wreckage of their efforts in the hope of having stirred up some worms or insects or almost any other type of small invertebrate or vertebrate. In the summer you often hear this ground and litter scraping and come to recognize it as a sign of nearby towhees. 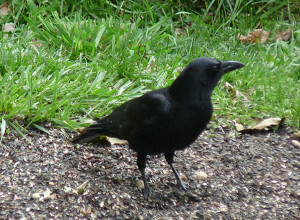 A foraging group of crows flew overhead. They wheeled and turned and filled the air with their raucous calls. 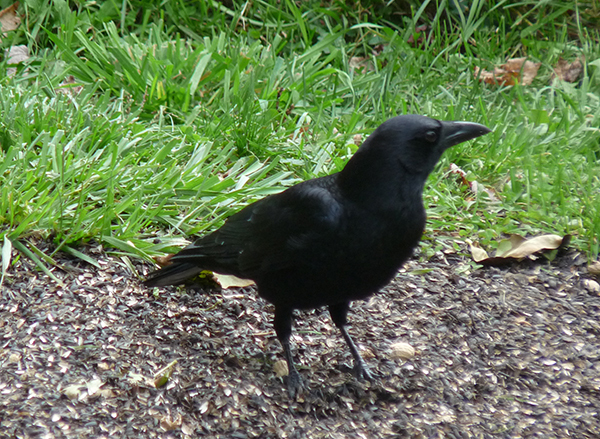 You never need to wonder if crows are around! They announce themselves with volume and energy! When I fill my bird feeders in the morning, my local crows are almost always perched in the surrounding circle of tall trees fifty or hundred meters away. Sometimes they watch silently as I fill the feeders and spread their morning favorite, peanuts in the shell! Sometimes they get so excited by the sight of the peanuts that they start bobbing and calling in anticipation. They won’t fly toward the yard until I go back into the house, though. They are loud, but cautious hunters. This hesitation on their part gives the waiting blue jays (who have been perched out of sight in my line of arbor vitae) enough time to swoop in and grab a few of the crow peanuts for themselves. Just on the edge of the parking lot a small chipping sparrow hopped from weed clump to weed clump pecking and rubbing at the plant stems with its beak. The sparrow seemed to be hunting purely by feel. Its eyes were open, but they almost looked like they were focused on some faraway object. Its beak did all of the probing and work. I didn’t see any obvious hunting success, but the sparrow’s prey might have been too small for me to see at distance. 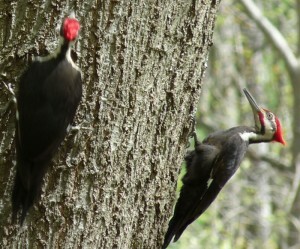 Finally, a pileated woodpecker flew over the parking lot and landed on the side of a distant tree. The woodpecker immediately started banging on the tree, and I saw some bark and woody debris float to the ground beneath him. It was hard to tell if this woodpecker was hunting and feeding on the insects in this tree or if he was drumming to get the attention of a female. It is a bit late in the spring to start looking for a mate, but hope springs eternal. Woodpecker holes in large, old trees are an important natural nest cavity site for bluebirds (and tree swallows, and chickadees, wrens and nuthatches!). 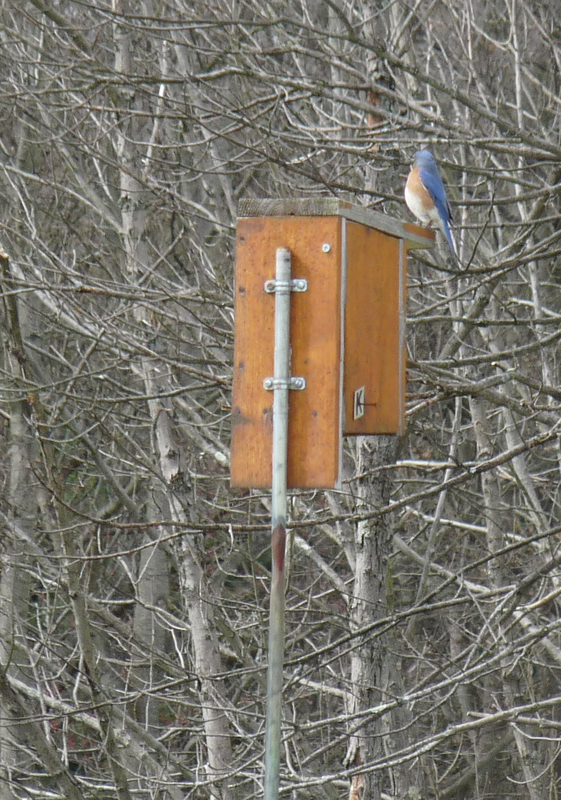 Our bluebird boxes are an artificial substitute for these once abundant, tree trunk and branch cavity sites. As our forest matures, I hope that we let the older, larger trees remain in place so that the woodpeckers can make them into cavity nester’s nest sites! An hour and a half has gone by. The flicker is still in the same spot eating his ants. The robins and bluebirds are cruising the field in their own ways and at their own paces. The towhees are still calling, but the crows, woodpeckers and chipping sparrow are gone. Deborah returns from her walk. It is too early for very many spring wildflowers and too cold for the few that are in flower to be open. While we are talking two turkey vultures circle over the car and then wobble away on the light breeze and disappear from sight. Most people with time to kill might site is a parking spot waiting for their spouse to return listening to talk radio or a music station and be consoled. But in your case, nature proves to be of so much more interest and entertainment. Enough so that your 90 minutes of waiting turn into a clever blog topic. Thanks for the birding observations. You saw more there than we did on a 3 mile wildflower hike. The difference is we had the company of fellow hikers and you made your time useful with the beauty of nature.